It’s less than two months until Fincantieri delivers Costa Diadema, the Italian line’s new 132,500-ton flagship and the first of a new class. With so much of the industry’s focus on so many other stories, Costa hasn’t been saying much about the ship which they are calling “The Queen of the Mediterranean.” But now it’s time is at hand. CND subscribers also read about football everywhere. 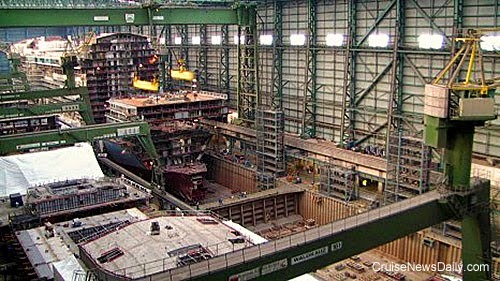 Construction update on Anthem of the Seas at Meyer Werft earlier this week. Later this month MSC Cruises is changing the cruise paradigm for North American cruisers. Now you will just choose one of three or four types of staterooms and the level of inclusiveness you want (in most cases two or three choices), and that’s all there is to making a booking. Now before you say it will never work, MSC has already been running this program in some countries, and it has been so successful, it’s ready for North America. CND subscribers also read about two gleaming examples of Dutch cleanliness ... and Princess sponsoring the Seahawks. MSC Armonia arrived in the Fincantieri yard at Palermo last Sunday, and 11 weeks from now, when it leaves, it will be a new ship. It is the first of MSC’s ships to begin the Renaissance project which will see four of them lengthened, adding more staterooms and facilities. You’ve heard of back-to-back cruises, but how about back-to-back to the 33rd power? A Mississippi man boarded Carnival Elation in New Orleans in April, and he just disembarked. 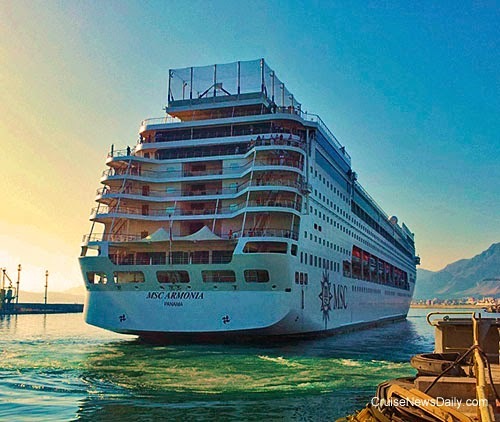 MSC Armonia arrived in the Fincantieri yard at Palermo (Italy) on Sunday (August 31, 2014) to begin an 11-week process of lengthening and refitting the ship with a number of new features. 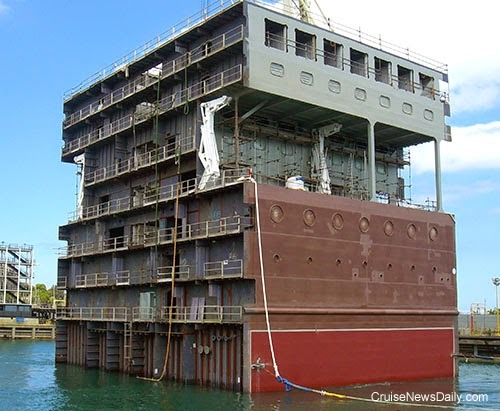 The new 24-meter midsection that will be inserted during the process is completed and floating near the dry dock where the ship is being cut in two. The actual insertion will come in mid-September. The new section will contain 194 passenger staterooms and 59 crew cabins. It will add 5,000 gross tons to the size of the ship. MSC Armonia arrives at the yard. Work began on the hull immediately. 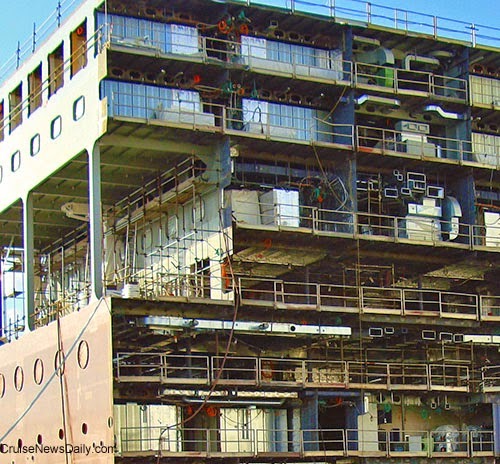 The new midsection was built at the Palermo yard and has already been completed. All of the fittings are complete in the section's interior and just need to be connected to those in the ship. Photos courtesy of MSC Crociere. All rights reserved. May not be copied or used without permission. Seattle, Wash., Sept. 3, 2014 — Holland America Line hosted a luncheon for the Canuck Place Children’s Hospice aboard ms Volendam Wednesday, Aug. 27, 2014, at the port of Vancouver, British Columbia, Canada. The event was attended by Victor De Bonis, chief operating officer of the Vancouver Canucks National League Hockey team, and John Garrett, sports commentator and former Canuck goaltender, who participated on a question-and-answer panel for attendees. Holland America Line has been a supporter of Canuck Place Children’s Hospice since 2005 through sponsorship of the annual Gift of Time Gala and shipboard luncheon events such as this one. After the luncheon, the 120 guests were invited to tour the ship. Canuck Place Children’s Hospice is British Columbia’s recognized pediatric palliative care provider. Over 560 newborns, children and teens with life-threatening illnesses and their families receive care from CPCH through outreach programs and two provincial hospice locations; Vancouver and Abbotsford. Services include clinical respite and family support, pain and symptom management, 24-hour phone consultation support and in-house clinical care, art and education, recreation therapy, grief and loss counselling and end-of-life care. Through the investment of the community and our talented team and over 325 energetic volunteers we make a lasting difference in the lives of children and the families who love them. For more information, please visit www.canuckplace.org. In addition to core services in the Hospice, Canuck Place provides consultation and education services to care providers and families. The counseling services are available to parents, siblings, loved ones and the child, to assist them in finding the courage and resources to cope with their challenges both during the child’s illness and after the child dies. For more information about Canuck Place, visit www.canuckplace.org. Rumors began to circulate over the weekend when a Reuters story was published, but they were confirmed first thing this morning when Norwegian Cruise Line Holdings issued a press release saying that they have an agreement to acquire Prestige Cruises International. The purchase price was listed as $3.025 billion in cash and stock, including the assumption of debt. It will be financed with existing cash, new and existing debt facilities and by issuing approximately 20.3 million shares of common stock. By now we’re used to seeing lines operate more and more ships in the Chinese market, but word came late today that a well-known ship is going to China, but it is being sold to a Chinese operator. RCCL said they would sell Celebrity Century to Exquisite Marine Ltd., a holding company led by Ctrip.com International Ltd. Celebrity will continue to operate the ship into April 2015.